In this cyber world, security is always the priority in any region. Similarly, secure browsing is a way to browse safely or say anonymously over the internet. Mostly user thinks that they very safe over the web for browsing lots of sites on their device. But that’s a misunderstanding as today there are lots of spy agencies that keeps track on users, so it is necessary to ensure your privacy by securely browsing the web. And in this article, I am going to discuss the same for Android users as in my previous I had stated the method to browse on PC securely. So have a look at complete guide explained below to proceed. Here I am going to tell some of the best secure browsers for Android that are always in incognito mode and always keeps your data clear whenever you close it. And these will provide you the safe browsing experience on your Android. So have a look on these browsers. This is one the best browser that every security alert user knows. This popular browser provides you the private browsing by default. The major part is that when you close it, app erases all data, such as browsing history, downloaded files, forms, cookies, and entered passwords. Also, this app provides you the fast page access from the websites. Many of you must be familiar with this cool Android browser as this browser provides you the high privacy while browsing the web. Similarly like above browser, this browser also clears all the data like cookies, form data, passwords and all other cache files. So must give a try to this cool browser. Adblock (pop-up blocker) Dolphin Browser is one of the best Adblock Browser. With Adblocker, you can block popups, ads, banners & ad-videos. Incognito browsing: Incognito browsing mode offers you real private browsing experience without leaving any history data. Clean UI and fast navigation: You can add your most visited websites as speed dial icons with a friendly user interface and one-touch access. One of the best and my favorite browser as this browser is just better than other browsers. This browser works on HTTPS everywhere policy, and that provides the high security while browsing and also its tabs are isolated from each other from one data to another that stops data trapping from other sites. Must use this browser at least once. Private: History, cookies and site data are never stored on disk, and never transmitted. Secure: Each tab is isolated in a separate OS process. Every tab is treated as a distinct instance, with its own memory storage and state. The another modern browser that must be well known by the students as this browser provides you the proxy to bypass the blocked sites over the WiFi. Also, this browser block ads on it and private browsing in it. Always Incognito: Your web history is never saved, and your cookies are always deleted. No one needs to know your surfing habits. Password Protected: Prevent any snooping on your recent browsing activity, even if it is still active in your recently opened applications. Only you can open Javin. CM is well known to an Android user. A group that had to develop lots of cool apps, similarly, their browser is also good and provides you the secure access over the internet and stops scripts that can track you over the web. Browse fast on your Android phone and tablet with the Google Chrome browser you love on desktop. Pick up where you left off on your other devices with tab sync, search by voice, and save up to 50% of data usage while browsing. You can use its incognito mode to browse safely. The Onion Router (TOR) support via Orbot. ASUS Browser is a fast and secure web browser. It provides an amazing web browsing experience by emphasizing speed, security, and being user-friendly. Its design allows you to browse and search the Internet at the fastest speeds while providing many exclusive features. Lightning speeds: ASUS Browser runs on leading Chrome-based engine to load web pages rapidly. Adapts to a region: The Navigation panel displays the popular websites according to your location. Secure Browsing: Built-in security features protect you from malware and phishing sites. Do-It-Later: Mark pages as a task to be read later when convenient. Apart from a browser, you can use some Best VPN For Android that gives you a secure private network to browse anonymously over the internet. Orbot bounces your encrypted traffic several times through computers around the world, instead of connecting you directly like VPNs and proxies. Use with Orfox, the most anonymous way to access any website, even if it’s normally blocked, monitored, or on the hidden web. Tor can help you confidentially research a competitor, get around the Facebook block at school, or circumvent a firewall to watch sports at work. Orfox prevents somebody watching your Internet connection from learning what sites you visit, it prevents the sites you visit from learning your physical location, and it lets you access sites which are blocked. Maxthon Browser is one of the highest rated browsers for Android today. It’s fast, secure, smart, easy to use. It brings you an amazing Premium web experience. Maxthon Browser is a secure browser that offers maximum privacy and security. Browse web pages without leaving any traces, enhancing your privacy & information security. Load web pages in advance for reading with no waiting, even offline. Maxthon Browser provides multiple search engines. Get instant search results from Google, Bing, Yahoo, Baidu, Yandex, and DuckDuckGo. So above is all about How To Browse Securely In Android. 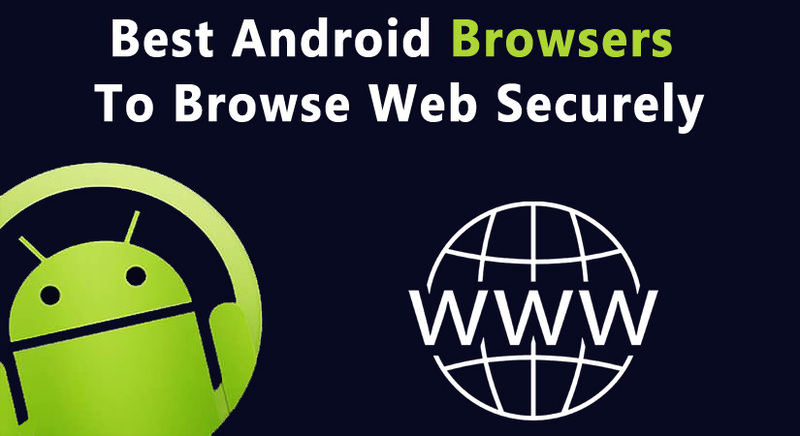 Use the above complete guide, and you will easily get secure while browsing the web through your Android device. Hope you like our work, keep on sharing. Leave a comment below if you have any related queries with this.